Esbjörn Wettermark | The Goose Is Out! Esbjörn appeared for the first time at the Goose many many moons ago at our evening for up-and-coming artists who we really wanted to give a gig to but – at the time – couldn’t fit in anywhere else! Esbjörn is a musician and ethnomusicologist with a background in Scandinavian traditional music. Since moving to London in 2009 he has, among other things, worked as a tutor for the English Folk Dance and Song Society, and he performs regularly with the Blackheath Morris Men. 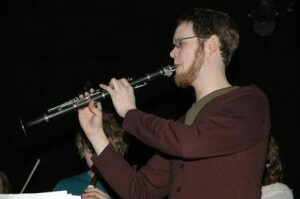 His main instruments are the clarinet and melodeon, but he also performs on a number of other instruments. In addition to English and Scandinavian music he has performed improvisational music and dance in collaboration with choreographer and dancer Sally E. Dean, and has studied and performed Vietnamese traditional music. As an ethnomusicologist he has spent the last 12 years studying Vietnamese traditional music, especially traditional theatre and chamber music, and has just completed his doctoral thesis on Vietnamese opera music at Royal Holloway, University of London. Click here to find out more about Esbjorn and his music! Click here to listen to some of Esborn’s music on MySpace!